In a medium saucepan, cover the Jerusalem artichokes with plenty of water and add half the lemon juice. Bring to a boil, lower the heat and simmer for 10 to 20 minutes, until tender but not soft. Drain and leave to cool. 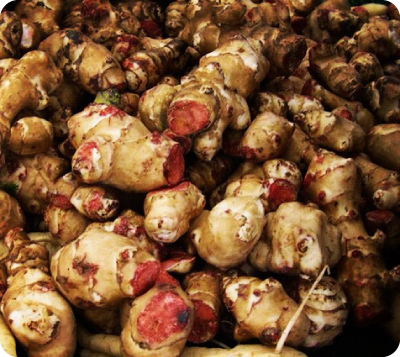 If you have never eaten sunchokes before, tread with caution as some people have trouble digesting them -- they are rich in inulin, which is great for intestinal health. Place the Jerusalem artichokes and all the remaining ingredients, excluding the remaining lemon juice and half of the tarragon, in a large mixing bowl and use your hands to mix everything together well. Cover and leave to marinate in the fridge overnight, or for at least two hours. Preheat the oven to 475°F / 240°C. Arrange the chicken pieces, skin side up, in the center of a roasting pan and spread the remaining ingredients around the chicken. Roast for 30 minutes. Cover the pan with aluminum foil and cook for a further 15 minutes. At this point, the chicken should be completely cooked. Remove from the oven and add the reserved tarragon and lemon juice. Stir well, taste and add more salt if needed. Serve at once. Not Included in Large Kitchen Boxes: Saffron Threads, Olive Oil, Pink Peppercorns, Salt & Pepper.